The 1969-70 OPC Stamps Set consists of 26 black and white stamps measuring approx. 1 1/2" x 1 1/4". 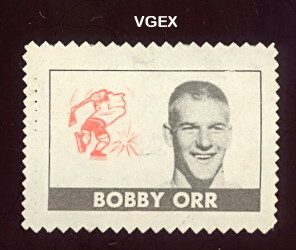 They were distributed as a two stamp panel in the first series of the regular 1969 OPC Hockey cards and intended to be stuck on the back of the corresponding regular issue hockey card. They are unnumbered, the listing is in alphabetical order.